The Form 471 application window closed Wednesday, March 27, 2019. Earlier that day, the FCC approved USAC’s PIA procedures for FY 2019 (DA 19-218). This is a key step that is required before USAC can issue the first funding wave for FY 2019. Another important pre-funding step will be USAC’s release of a preliminary demand forecast for FY 2019. This typically occurs a few weeks after the close of the window. Based on USAC’s FRN Status Tool, we estimate that the preliminary demand will be approximately $2.90 billion. That figure is up about 5% from FY 2018 and is well within the $4.15 billion funding cap for the year (see DA 19-170). Encouragingly, roughly a third of the applications, representing 8-9% of the requested funding, are already in “Wave Ready” status. USAC issued Wave 51 for FY 2018 on Thursday, March 28th, for only $147 thousand. Cumulative funding as of Wave 51 is $2.18 billion. Although the deadline for filing Form 471 applications for FY 2019 was March 27th, new applications can still be entered and certified in EPC. Late-file Form 471s are considered “Out-of-Window” and will not be considered by USAC unless the March 27th filing deadline is waived by the FCC on an application-by-application basis. The FCC has routinely approved deadline waiver requests for Form 471 applications submitted within two weeks of the original USAC deadline. For FY 2019, this two-week period ends on Wednesday, April 10th. FCC waivers for Form 471 applications filed after this date have occasionally been approved but only for “extraordinary” circumstances involving serious hospitalizations, deaths, or military deployments. Instructions for “Submitting Window Waiver Requests” are provided in the final section of USAC’s FCC Form 471 Filing guidance as reproduced below. Applicants requiring a window waiver are encouraged to file their waivers as soon as possible to ensure their applications are put in-window in the next few months. 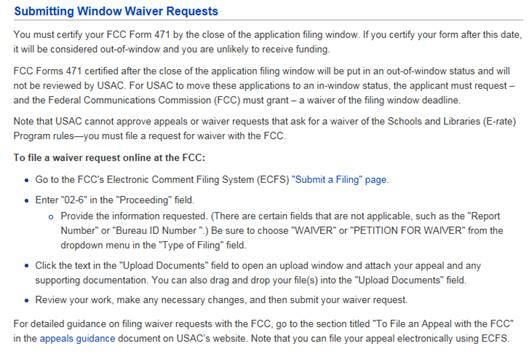 As of last weekend the FCC had already received over 45 waiver requests to accept FY 2019 out-of-the-window Form 471 applications (see waiver examples). USAC is expected to announce that it will unlock entity profiles in EPC later this week. The profiles were locked during the FY 2019 Application Window to freeze school entity data so as not to impact the application work of libraries and consortia. It is important to note that any changes applicants now make in their EPC entity profiles will not automatically carry through to FY 2019 applications. To make entity changes that apply to pending applications, applicants must submit RAL modifications (see USAC’s Schools and Libraries News Brief of March 22, 2019). USAC’s News Brief of March 29th (referenced below) notes that the web addresses of some legacy system forms and tools are being changed and updated. Access to the old addresses will be automatically redirected to the new addresses, but users may find it more efficient to update older bookmarks. Last week’s URL changes updated the web addresses for the Form 474 (“SPI”), the Form 486, and the Data Retrieval Tool (“DRT”). April 1 Deadline for submitting reply comments to the FCC’s NPRM (FCC 19-5) to permanently eliminate the amortization requirement on special construction charges (see our newsletter of March 25th). Review and archive competitive bidding documentation. Monitor your contact email address and EPC account.